When I found out one of my clients use to have her own vegetarian baking service I knew I had to convince her to share some of her yummy recipes on the NMFIT Blog! Pallavi Shetty is sharing a few her traditional Indian inspired recipes with NMFIT. Below is the first recipe, so easy to make even if you are not a cook. How often have we heard that breakfast is the most important meal of the day and yet how often we have skipped it at some point owing to our busy schedules. A healthy breakfast provides us with the fuel required for our hectic lives, helps in our cognitive functioning, weight loss goals and contributes to our overall wellbeing. 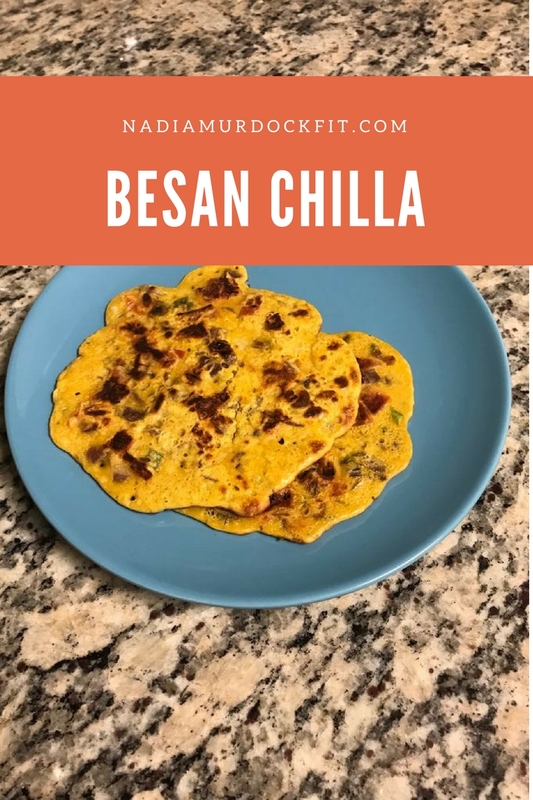 So instead of starting our day with foods loaded with preservatives or eating out of a jar, try this wholesome, healthy and nutritious recipe of Besan Chilla (aka Gram Flour Pancakes). Gram Flour or Chickpea Flour, the main ingredient in this recipe, is an excellent source of carbohydrates and proteins. It is a low-calorie ingredient, thereby making it an excellent choice for those looking to lose weight. The use of ginger, carom seeds, cumin seeds and turmeric in this recipe also aid in digestion. This is a great recipe for those looking for Vegan, Gluten Free breakfast or snack options. Sift the gram flour in a large bowl. Sifting the flour helps to prevent any lumps in the batter. To the flour, add the chopped onions, tomatoes, ginger and coriander leaves. Mix well. Next add the carom seeds, turmeric powder, chili powder, and salt. Mix all the ingredients well. To this flour-spice mixture add water. Starting with about ½ cup of water, gradually add water till the batter has a smooth flowing consistency. The quantity of water required will depend on the texture and quality of the gram flour. Ensure that the batter is mixed very well and remove the lumps if any. Once the batter is ready, heat a griddle or a nonstick pan over a medium flame. Sprinkle a few drops of canola oil or vegetable oil on the pan to season the pan. Once the pan has become sufficiently hot, pour a ladle full of batter into the pan and gently spread the batter with the back of the ladle. Pour a few drops of oil on the pancake, and let it cook well on a low to medium flame. This might take about 1-2 minutes. Cook till the base of the pancake gets a nice golden color. Flip it over using a spatula and cook the other side too. Make the rest of the pancakes in a similar manner. Remember to pour a few drops of oil before pouring the batter to make pancakes. Serve hot with a mint-coriander chutney, plain yogurt or ketchup. If not serving immediately, keep covered in a casserole to keep the pancakes warm. The soul of a girl who aspires to be fit with the appetite of a girl who can gobble anything sweet. That sure is a weird combination but that pretty much sums up my life, aspirations and everything in between. My name is Pallavi and I have grown up in the most eclectic city of India – Mumbai. Living in Mumbai all my life has made me experiment with varied cuisines since an early age, be it the humble Vada Pav or the more quirky Pizza Dosa. Somewhere along the way, began my love for food....desserts to be specific. And just as love makes one do unexpected things, I did the same. I left my “Secure” job in marketing, took up a course in pastry arts and started my own venture. I love spending my time in my kitchen where I try to conjure up new flavor combinations or bake something different. Apart from cooking and baking I also enjoy exploring local places for delicious and exceptional sweet treats. This is my humble attempt at cooking unique yet simple dishes with everyday ingredients so that cooking doesn’t seem so intimidating. If I can do it, I’m sure so can you! !